Time to get ready for our annual Fulton Heights Yard Sale! No cost to residents! Just set out your good stuff! 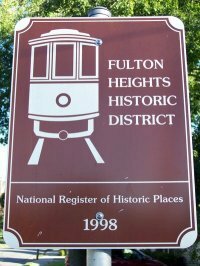 Fulton Heights was established in 1902 and put on the National Register of Historic Places in 1999. Some of the ads promoting its development read, “A place for Pleasure and Comfort”. 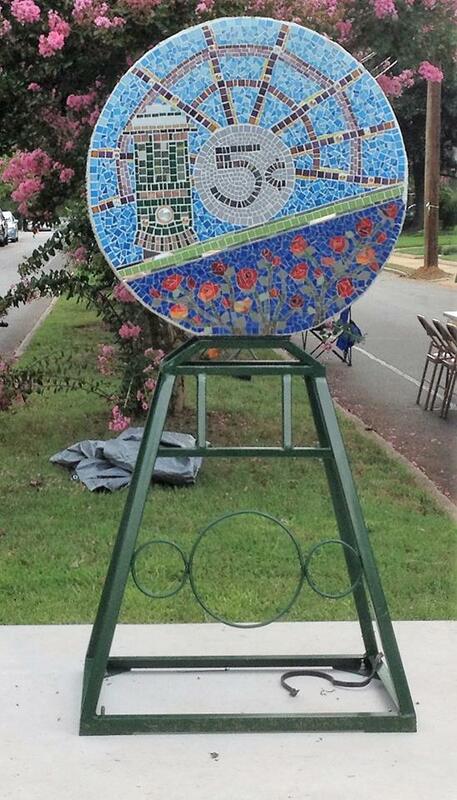 The mosaic “coin” was sculpted by artist Jeanette Brossart from Greensboro and represents some of the neighborhood’s history. Notice the trolley, the tracks, and the 5¢ token needed for a ride. The mirror stripes on the edge of the coin reflect our history. Look for the original plat map of the neighborhood and the Ferris wheel from the original amusement park. The roses depict the commercial rose houses on Elm Street. The custom stand has an abstract trolley architecture. Our welcoming Mosaic sculpture was funded by neighborhood residents along with a grant from the Rowan Arts Council and assistance from city staff. It was installed in August 2016 in the 100 block of the Mitchell Avenue median. You may have noticed some warehouse-type buildings on Elm Street, or some of you may even remember the glass greenhouses or a beautiful rose bush that bloomed on an abandoned lot in that vicinity. These are remnants of the once thriving floral business that belonged to the Hanford family on the edge of Fulton Heights. It all started back in 1888, when John Wilbur Hanford and his wife, Emma, settled in Carbondale, Illinois. They owned a mercantile and were accomplished musicians in the community. John W. was also an avid gardener and horticulturalist, and his hobby grew into the operation of two prosperous greenhouses. Their son, John Van Hanford, was born in 1893, and in 1899 the family moved to Grand Junction, Colorado to operate a fruit ranch. They resided there until 1905, when Mrs. Hanford was advised to move to a different climate because of her poor health. John W. had read an article in a national magazine that was written by Colonel William H. Neave, extolling the virtues of the music programs, cultural levels, and climate of the North Carolina Piedmont in general and Salisbury in particular. The Hanfords promptly moved to Salisbury, and they built three greenhouses and auxiliary buildings on Elm Street to serve the floral needs of the area. John V. entered the business in 1910 at age 17, expanded production and growing facilities, and opened a retail florist shop, J. Van Hanford, Florist, at 125 West Innes St., acclaimed as one of the finest stores of its kind in the South. John V. married Mary Ella Cathey in 1917 and they had two children, John Van Hanford Jr. (1923) and Elizabeth A. (1936) – we all know the history of Elizabeth A. Hanford Dole! After World War II, John V. brought his son, John V. Jr. to the business, and changed the name to J. Van Hanford & Son, Wholesale Florists. They made use of air service, refrigerated trucks, and provided floral delivery as far out as 150 miles! In 1948, they opened a branch office in Charlotte. For the next three decades, John Van Hanford Jr. led the business in expansion and growth that included floral design, artificial flowers, holiday ornamentation, gift-ware and decorative home accessories, importing live flowers and products from around the globe. In 1978, J. Van Hanford & Son, Wholesale Florist was sold to Gregory Damron of Charlotte. Fulton Heights has three “avenues,” Mitchell, Maupin and Wiley. These streets were named for the men of the Southern Development Company who were the original owners. The other “streets” of Fulton Heights were dedicated to similar well-known or influential individuals of Salisbury, such as Colonel Archibald Henderson Boyden, who was a pillar of the Salisbury community for 82 years. He was born in January 1847 in his home on the corner of Church and Fisher streets, which had been built in 1760 and is the current site of the Rowan Public Library. He died there in June of 1929. As a youth, he attended a private school in Alamance County until he was 15 years old. Then he ran away in 1863 to join the command of Major General Robert Hoke, becoming his personal courier during the Civil War. He followed Hoke through the battles of Cold Harbor, Five Forks, the Wilderness campaign, Petersburg, Fort Fisher and finally to Hoke’s surrender at Durham. After the war, he went into the cotton business in Raleigh for a short time while he recovered from his war injuries and later returned to Salisbury, forming the Boyden and Overman Company. President Cleveland appointed him postmaster of Salisbury in 1885, a position he occupied for 17 years and off and on over the next 40 years. “Baldy,” as his friends knew him, made his greatest contributions to Salisbury through its schools. He was elected mayor of Salisbury from 1901 to 1909, and he fought for better educational facilities on a very personal level—he borrowed $25,000 from the Wachovia Bank to build the first Ellis street school. (This note was eventually repaid with local liquor taxes.) From this humble beginning, the Salisbury school system grew to eight schools, including Boyden High school, considered one of the most beautiful and best equipped in the state for its time. About a year before his death he looked back across the years and, with his characteristic bluntness, declared, “Short-sighted policy and stiff-necked conservatism have prevented Salisbury from being the leading city in North Carolina—Charlotte was once known as a town 40 miles south of Salisbury.” Few men in Rowan County’s long history left a deeper imprint on the community than Col. A.H. Boyden. How fitting that a small memorial to his great character is with us each day on the streets of Fulton Heights. Another well-known and influential individual who is still with us on the “streets” of Fulton Heights was Mr. James Daniel Heilig. He was a native of Rowan County, born in 1857 near Gold Hill and moved to Salisbury as a child. He attended Roanoke College at Salem, Virginia and the University of North Carolina, but had to give up his studies because of eye problems. Mr. Heilig was known as a jovial gentleman who was extensively involved in his community, prominent as a Rotarian, Mason, Knights Templar, Shriner and an officer in the Lutheran synod for over 37 years. He was on the Salisbury Board of Alderman and Chairman of the Street Committee. He was best known for “personally driving a snow shovel team over the sidewalks” to keep them clear for citizens after a big snowstorm. It isn’t often that we learn about the ladies of this era, but Mrs. J.D. Heilig’s activities were reported quite often in the news. She was active in her church and as a Daughter of the Confederacy. Her home was a center for hospitality and entertainment. She played bridge and was a bit of an entrepreneur in her own right – famous for her strawberries, tomato plants and “cream and sweet and sour milk,” which she sold. Mrs. Heilig lived until 1946, but James D. Heilig died in 1929 at age 71 in his home at 507 South Fulton Street after an extended illness. Salisbury had lost another colorful character, but his name is preserved for the ages on the Streets of Fulton Heights.